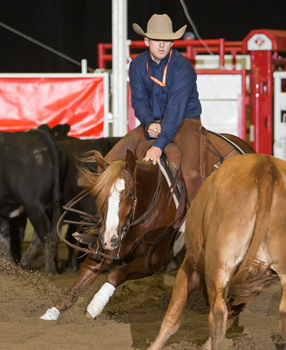 July 14th, 2016– This Cats Max (by, WR THIS CATS SMART) and Travis Rempel marked 225 to win the Mercuria NCHA World Series of Cutting at the Calgary Stampede on July 13. This Cats Max is bred and owned by Doug Wiens of Lindell Beach, British Columbia. The 7-year-old is by WR This Cats Smart out of PF Docs Med, by Peppys Formula. Dustin Gonnet won the Calgary Derby and Silver Slate Futurity with the gelding. His latest win takes him over the $100,000 mark in career earnings. Rempel was the only rider with two horses in the finals. He also placed third on Suzie Blue, a Mecom Blue mare owned by James Mann of Abbotsford, British Columbia. This was Rempel’s biggest win so far, with his finals checks taking his earnings over $79,000. He has previously been a finalist at the Calgary and Canadian Supreme limited age events.